What a great joy it is to release an album by two old friends, one a long-standing Earth Mantra artist, and the other with his first album on our humble netlabel. 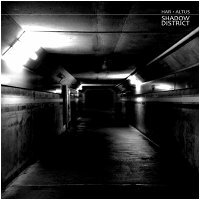 This is precisely the pleasure we have today, as we introduce Shadow District, the brand new collaboration by ambient masters Har and Altus. An album by either one of these artists would be cause for celebration, but together the results simply astonish. A full seventy minutes of transcendent music await the listener, somewhere in the netherworld between dark ambience, melodic ambience, and pure electronic space music. As one would expect, the compositions themselves are near peerless, with point, counterpoint, interlude, and response all easily identifiable to those listening closely. And, also as expected, the sound design is lush and three dimensional, the performance inspirational, and the production immaculate. Attention to detail is certainly among the many strengths these artists possess. What really does it for us, though, is the raw emotion barely held at bay in this powerful music, the palpable sense of despair and determination, of pain and hope, of disastrous loss and hard-won victory. One can picture the grit and grime of this dark underworld, of this merciless street that punishes so many and allows so few to escape to the light of day. And yet one can also sense the moments of triumph amid the ruins, when the human spirit rises above its miserable surroundings to fly free despite all odds. The duality in this music both inspires and awes the listener, with something for fans of nearly all ambient traditions to love. Truly magnificent work. So it is our distinct honor to announce the availability of Shadow District, an album that we think is destined to be a classic of the genre, surely one of the top ambient releases of 2012. And nothing less than music for the ages. Be sure to check out the cool promo video as well. If you like the mood of Blade Runner, but drier, check this very nice record. Atlus is a very good ambient artist, and here I find a darker vision of him. Kudos to Har. A stellar album through and through! To those on the fence, check out the last track.